UPDATE - Online Tickets are SOLD OUT. Some tickets are still for sale at Blind Rhino South Norwalk. Call 203-956-7243 to reserve your seat. Hurry! Tickets are subject to availability. 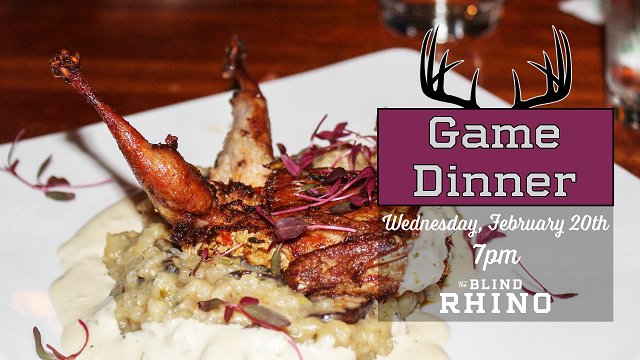 This is our 2nd Annual Game Dinner, which we do every year in the winter at our South Norwalk location. The current roster includes venison, wild boar, ostrich, frog legs and a few players to be named. Keep an open mind, an open belly, and let Chef Angel and Big Game Mike take you on a culinary adventure! Tickets are $95, and that is all-inclusive of food, drink, tax & tip!